Have you ever visited a museum that is floating on the sea? Then you must visit the Louvre Abu Dhabi - the art and cultural beacon located in Abu Dhabi. The Louvre Abu Dhabi is the first museum of its kind in the Arabian world housing a collection of more than 600 artworks. After a decade of making, the museum opened its doors on 11th November 2017. Take a stroll through the promenades and explore the magnificent art while overlooking the sea. Here is a guide on what to explore and make the most of your visit to Louvre Abu Dhabi. 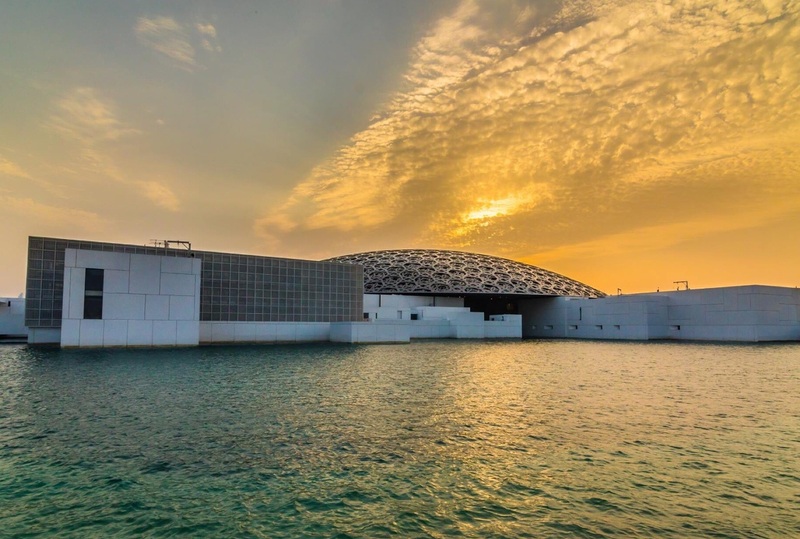 The Louvre Abu Dhabi welcomes you to explore the world of art in the sea. Just like exploring the normal city, visitors can explore the 55 detached buildings. Louvre Abu Dhabi is ideally located on Abu Dhabi’s Saadiyat Island designed by French architect Jean Nouvel. It boasts of whopping 55 buildings, out of which 23 are permanent gallery spaces, Children’s museum, a research centre, an auditorium, exhibition spaces which are connected by footbridges over the ocean beneath. Have you ever experienced the rain of light? The museum is covered under a 180-meter diameter long silvery dome. The dome filters the sunlight and creates a moving ‘rain of light’ beneath the dome resembling the sunlight passing through the palm trees in the country’s oases. When you’re walking on the footbridges, you can witness both sea as well as the Abu Dhabi skyline. Also, the museum includes a restaurant, café, and a boutique gift shop. What’s Inside the Louvre Abu Dhabi? Take guided tours of galleries, which will explain the artworks’ significance as well as historical background and make the tour not only enlightening but also educational. Galleries are divided into 12 chapters, each indicating an era in history. The galleries of Louvre Abu Dhabi tell an inspiring story of humanity through 12 chapter journey. Follow the numbers on the gallery walls to navigate 23 galleries easily. As part of the unique collaboration between Abu Dhabi and France, Louvre Abu Dhabi hosts four temporary exhibitions a year. These temporary exhibitions will be created and organized by 13 French museum partners. The museum hosts family-focused exhibitions and interactive workshops that inspire the young minds through its artistic techniques and ideas. It is located across the two floors. Louvre Abu Dhabi admission includes exclusive access to galleries, exhibitions, Children’s museum, & public spaces. Where to Buy Louvre Abu Dhabi Tickets? Visitors can purchase the tickets online, on-site or at the museum. Are you reaching Abu Dhabi/ museum via Sheikh Zayed Road or E11? Then you must not miss the opportunity to experience the world’s first radio-guided highway art gallery. Keep your eyes on the road, as your car approaches the Highway Gallery, just tune your FM device to Radio 1 at 100.5 FM or Class FM at 91.6 FM or Emarat FM at 95.8 FM to listen to the title, artist, description etc. of the giant art piece located next to you on the highway. Explore the light-filled structure with a perfect desert-island setting!